The Youth ID program consists of a credit card size photo ID of the child that is carried by a child’s parents or guardian who maintain complete control of the card. In an emergency, the card can be given to local first responders to aid in the rapid location and safe return of the child. A sample picture of a card appears below. Parents complete a brief information form and authorization. A digital photo is taken and the information and photo placed on the card and the card issued to the parents. 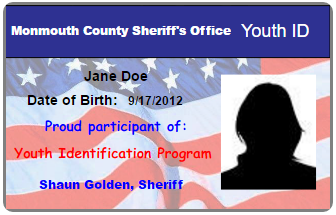 “The photo ID process is fast, friendly and does not compromise the privacy or identity of your child,” says Sheriff Golden. “Our Youth Identification Program can help to ensure the safety of our children and keep Monmouth County a safe place to live, work and raise a family”. For more information about the program, please contact Selina Mishkin at smishkin@mcsonj.org or 732-431-6400 x1185.